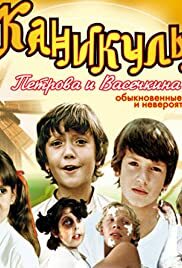 The first movie about funny adventures of two best friends - Petrov and Vasechkin. A comedy about tigers and lions running around a cruise ship full of passengers. A family hires a babysitter who seems to possess magical powers. A satirical comedy about the excessive restrictions that children face during their vacation in a Young Pioneer camp. Gang boys from the streets of St. Petersburg, Russia are being tamed and educated at SHKID - Dostoevsky School.